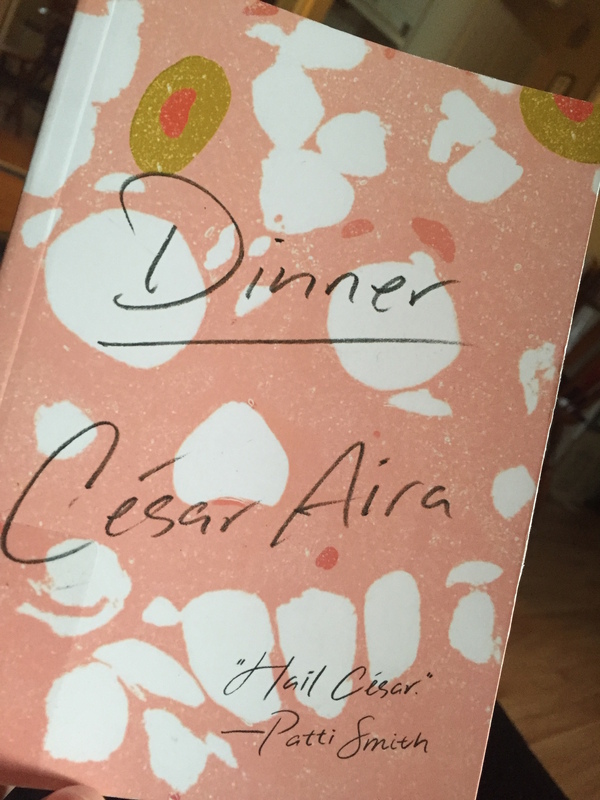 A friend of mine asked for a book recommendation today, and I told her to read Dinner by César Aira without even thinking twice. This cute little book has a pink cover (it’s actually a picture of that disgusting macaroni-olive loaf, a slap in the face to both macaroni and olives) and may or may not be about zombies. This novella, which was originally published in Spanish, will leave you second guessing everything. It starts off emphasizing how important people’s names are, and ends with an entire town being killed and eaten by the living dead—or does it? The unnamed narrator, who is a single man living at home with his mother, either spends most of the book watching a very detailed news report, having a terrifying dream, or did some drugs the reader didn’t notice and is having a horrible trip. You have to read the book for yourself to decide, and then spend the week afterwards thinking about what did or didn’t happen. You think you know what this book is about, but you also have no idea. Nothing is what it seems, which is what makes it so good. If you’re looking for a quick afternoon read, get your hands on this book. I promise you won’t regret it.